That’s right, puddin’! 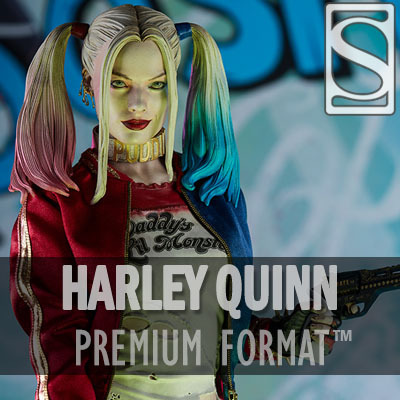 Sideshow is proud to present the Harley Quinn Premium Format Figure, based on Margot Robbie’s explosive appearance in the DC film Suicide Squad. Gotham’s very own maid of mischief is stepping out (of prison) with style, and every inch of her exudes attitude. Standing 19” tall, Harley Quinn is decked out in her Suicide Squad outfit, which features a bright red and blue color scheme with her dip-dyed matching hair from the film. Her traditionally clownish makeup is replaced with vibrant eye shadow and striking red lips, keeping with her updated theme. Harley’s now-iconic “Daddy’s Lil Monster” shirt and shorts are sculpted onto the figure, and she wears a matching fabric jacket and fabric tights. The printed jacket logo along with her “PUDDIN” choker remind you that her heart lies outside of the Suicide Squad, as she patiently waits to reunite with her beloved Clown Prince of Crime. A variety of detailed tattoos and dangerous accessories complete her colorful costume. Whoever she’s been hired to hit, Harley Quinn comes prepared as she menaces you with a coy, teasing smile. This girl is known to shoot from the hip, holding her gun ready to make a move with the rest of her crew. Harley has one hand resting against her goodnight bat, which is detailed with deranged scrawling wrapped around the barrel.